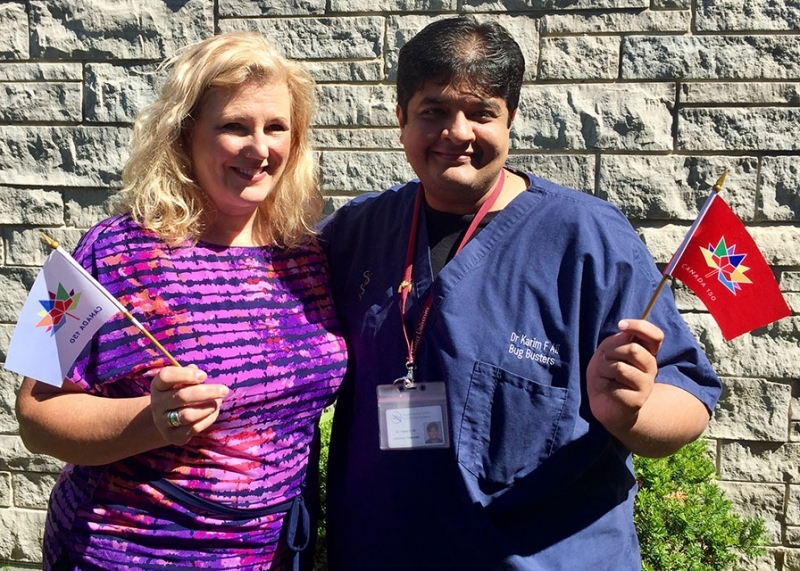 It doesn’t take long to realize how proud Dr. Karim Ali is about becoming a Canadian citizen. Greeting you outside his St. Catharines home is a large “Canada 150” flag. Sitting on a table inside are two smaller versions of the flag. On July 1 -- Canada’s 150th birthday -- he will take the Oath of Citizenship and become a Canadian citizen. Karim, Niagara Health’s Director of Infectious Diseases Division and Antimicrobial Stewardship Program, says he’s excited about the swearing-in ceremony. Joining Karim at the ceremony in Niagara-on-the-Lake will be his wife, Mehnaz, who is also from Pakistan and became a Canadian citizen in 2014, and their one-year-old daughter, Izna. “For me, the most important thing about being a Canadian is tolerance, just overall being nice to each other,” says Karim, who moved to Niagara in 2012 after completing his education in the United States. Karim won’t be the only Niagara Health team member taking the Citizenship Oath on July 1. He will be joined by Judy Antonio, an administrative assistant at our Greater Niagara General Site in Niagara Falls. Judy was born in the U.S. but has lived in Canada since 1983. It was only recently that she decided to become a Canadian citizen. Extra special for Judy is that her two Canadian-born sons, Thomas, a Canada Border Services Officer in Vancouver, and Stephen, a Mechanical Engineer in Guelph, will attend the swearing-in ceremony in Niagara Falls. “They’re so happy for me. They think I’ve come over to the bright side,” she says with a smile. It’s difficult for Judy to hold back her enthusiasm about becoming a Canadian citizen.